One of my favorite memories of my grandfather is when he would take me hunting for morel mushrooms. He had a special walking stick reserved only for this activity. I would learn later in my mycology classes in college that this is a common practice among the old-time mushroom hunters. In fact, the stick is said to be imbued with special mushroom-hunting luck and isn’t just a walking stick at all. Note: The good news is, you can search Amazon for a morel mushroom hunting book for your area! 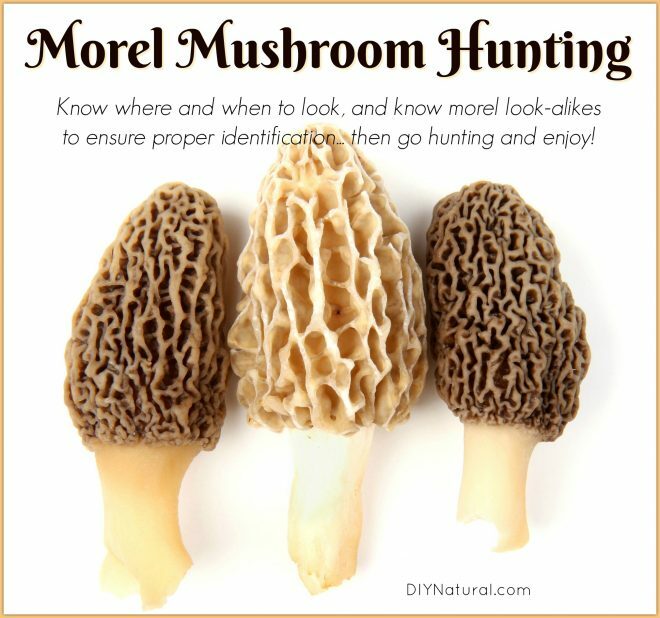 If you went morel mushroom hunting in the woods, would you know what to look for? There are many, many different kinds of morels. They vary in their choice of tree to grow under to their color and even when they prefer to fruit. At one time there were over 80 different kinds of Morchella spp. believed to be identified around the world. Many of those were probably duplicates of species that had already been seen. We still have quite a shocking amount of diversity in this mushroom and controversy rages on as to how many true species there are. There is more than one look-alike out there in the woods. Morel mushroom hunting isn’t as easy as it sounds. The “false morel,” Gyromitra esculenta, can be found throughout North America and Europe. It is considered by some to be a delicacy, but it is known to be toxic if eaten raw. This isn’t too surprising as almost all mushrooms contain toxic qualities that are only neutralized when cooked. Recent studies have shown, though, that the false morel continues to be mildly toxic even after being cooked. Apparently it hasn’t killed off too many of the traditional populations that love to eat it, but I wouldn’t recommend bringing this one home. The Gyromitra esculenta has a brainy look to its cap, but the ridges wander randomly. This is in stark contrast to the orderly, corrugated cardboard-looking, vertical ridges in the Morchella spp. In the false morel, the caps look more like a pile of intestines switching back and forth and up and down. The Verpa spp. is another look-alike, but while it has a ridged cap, it is only attached to the stem of the mushroom at the peak. A true morel’s cap is attached at its peak and at its base to the stem. If you decide to go morel mushroom hunting this season, be sure to know your local variety of morel. Is it the black, yellow, white, or half-free? Knowing the answer to that question will ensure proper identification, thus keeping you safe. Furthermore, it will help you understand what kind of terrain to look for, because each of these mushrooms prefers a different tree and a different soil type. Know your mushroom, know its look-alikes, know that you are allowed to be on the property, and be sure to get a magic, mushroom-hunting, walking stick. I’d tell you where to look for these delectable treats, but, well… it’s a secret! We found some growing in the back garden in Suffolk, not under a tree but between unkept paving stones, wonder if anyone has found same. They look the real deal, have steamed and frozen them but nobody is taking taking the plunge to eat them!